The Timesavers Business Exchange is held every few months at Broadwas Village Hall with the aim of introducing local rural businesses to one another to help heighten your business profile and increase your contacts. The format of the meeting is very informal; no need to wear a suit, no presentations, no three minute speeches, just lots of introductions and opportunities to swap business cards and information about your business. Each meeting is sponsored by a different business who has the opportunity to showcase their business in which ever format suits them best - for more information please contact us. Can I sponsor a meeting? Absolutely! There will be an opportunity for one business to sponsor each meeting (and by sponsor we mean provide the funds for some light refreshments!) and to showcase their products and/or services. Nothing! As long as we can find a sponsor each month to cover the cost of the sandwiches, attendance at the meetings will be free. If we can't find a sponsor for any of the meetings then we will ask for a small contribution to cover the refreshments but that contribution will not exceed £5. The meetings will be held every few months at Broadwas Village Hall, Stoney Ley, Broadwas on Teme, Worcesteshire from 12 noon until 1.30pm. 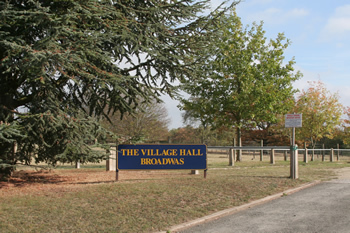 The Village Hall has a generous car park and there is further parking a one minute walk away in the car park adjacent to Broadwas Primary School on the A44. Who are Timesavers Concierge and why should I attend? Timesavers Concierge is a new business based near Broadwas. We support busy people and businesses by helping them work through their 'to do' lists at the office and at home. We offer a range of services based on our skills covering social media consultancy, HR management, marketing and business services as well as practical day to day support. We believe that having good local contacts is vital to any small, rural business so we are hoping that you will join the Timesavers Business Exchange and network with your local business neighbours. We would be most grateful if you could RSVP by using the form below to indicate whether or not you are able to attend our next meeting.